Open Domino Server Certificate Administration (CERTSRV.NSF). Select Install Trusted Root Certificate into Key Ring. 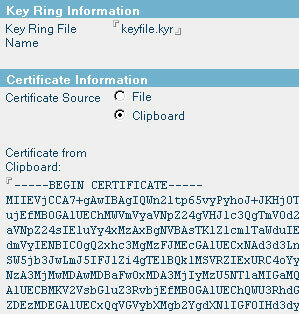 Specify the file name of the Key Ring file that you created when you made your CSR. Install the Root Certificate by selecting File and typing the file name and path of the Root Certificate or by selecting Clipboard and pasting the contents of the Root Certificate, including the BEGIN CERTIFICATE and END CERTIFICATE lines, into the box provided. Click Merge Certificate into Key Ring. and enter the password for the Key Ring. If you received an Intermediate certificate from your Certificate Authority, select Install Trusted Root Certificate into Key Ring again and follow the same procedure as the previous step to install it to the KeyRing. Select Install Certificate into Key Ring. Specify the file name of the Key Ring file and specify the path to the certificate or paste the contents of it into the box. Click Merge Certificate into Key Ring button.